One of my favourite things that’s quickly coming out of running the Aussie WIP Wednesday is that it’s giving me a good kick to actually DO something on my WIPs so I have something to show you! Yesterday, with the big children off to nanny and poppy’s for a sleepover, and the grumpy baby tucked up in bed asleep, I pottered about the studio. A couple of Project Life layouts down, I looked around and thought about doing some tidying up. For all of about 30 seconds. Then I thought about working on my editorial calendar canvas, but the time was slipping away and I knew it wouldn’t be all that long until Beetle woke – likely just as I got paint all over my hands. 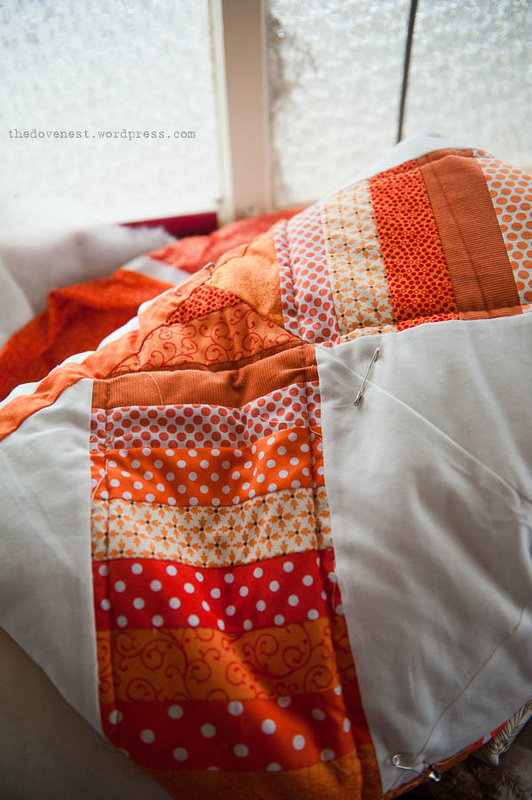 Then my eyes landed on this – fondly known as The Orange Quilt of Awesome. A flurry of activity late last year brought it so close to done, but it needed a little bit of work to correct a small error in the backing. 15 minutes later, the backing was fixed, the binding reattached, and it was spread out on the loungeroom floor for trimming. With everyone except Beetle off at school and preschool today, I’m planning of whacking on a movie and getting busy getting this binding stitched down. Of course they are! I love seeing what other people make – even when it causes me to drop everything I’m doing and try something new, because focus isn’t really my strong point! ooh, fab, I want to see this finished! me too! Just the stitching down part to go, hopefully by the weekend we should have progress! You and me both! I think I know what I’m doing for Saturday night craft along!